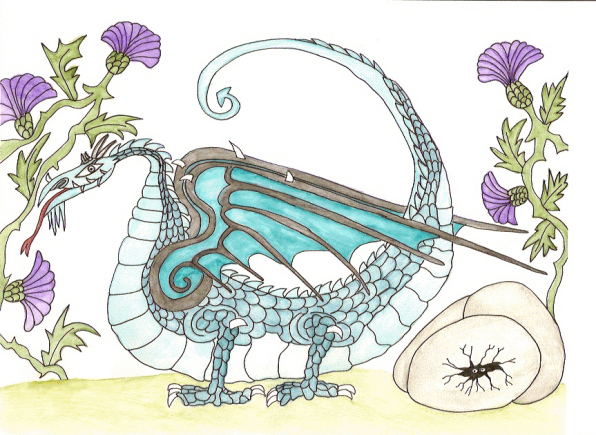 Papa dragon stood among the thistles. He guarded the three eggs while Mama went off to find something to eat. Papa stood as high as a house and his wings, when spread open, were wider than he was long. He had sharp fangs and a long, scaly tail. The second egg cracked and then the third. The three eggs stood next to each other and the tiny dragons inside whispered to one another. “What is that creature? It's big and it has fangs and claws. I'm not pecking my way out of this shell. It's not safe.” They talked back and forth. Papa dragon watched patiently, making sure nothing harmed his eggs. All day he stood there, guarding them. Papa turned around, swinging his long tail and wings out of the way. He bent his head over and stared into one of the holes in the eggs. Papa saw three tiny dragons, all the same color as him. “My boys!” He kissed each of them with a dragon kiss.